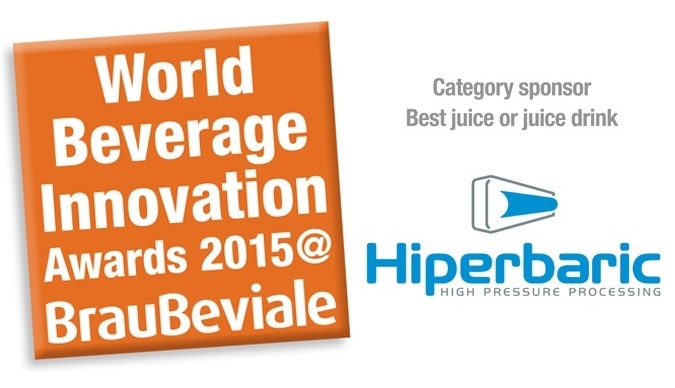 Hiperbaric has been announced as the sponsor of the ‘Best juice or juice drink’ category in FoodBev Media’s World Beverage Innovation Awards 2015, now open for entry atwww.FoodbevAwards.com. Founded in 1999 and based in Spain, Hiperbaric designs, manufactures and markets high pressure processing equipment for the food and beverage industry. Now in its 11th year, the World Beverage Innovation Awards@BrauBeviale, is in association with BrauBeviale, the world’s largest beverage industry trade event. The 2014 awards, presented at Brau Beviale, attracted over 325 entries from 40 countries in 26 categories. FoodBev Media has signed a rolling agreement with Nuremberg Messe to stage the presentation of finalists and winners at a special event during the world’s largest beverage industry trade event, BrauBeviale 2015, in Nuremberg, Germany – and every fourth year at Drinktec in Munich. Entries to this year’s competition are open now and will close on 22 September 2015. The awards ceremony will take place at BrauBeviale on 11 November 2015.